I admit, I had my reservations about how William Dalrymple's City of Djinns would be adapted to a theatrical performance. 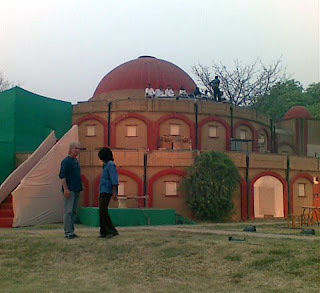 Since it is one of my favourite books, I went more out of curiosity than excitement to watch a preview of the play yesterday on the lawns of Maati Ghar at the Indira Gandhi Centre for Arts in New Delhi. 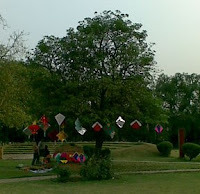 As I reached early, I saw the preparations for the play in full swing. And this does not include just the artist rehearsals, but the other people who would play a role in creating the 'experience' for the play. So I watched as the kite seller decorated his kites on the branches of tree and the kulfi seller put his matka in place and last but not the least, the seekh kabab wallah heated the charcoal. The atmosphere was building and I was experiencing my first pangs of excitement for what lay ahead. Artists of the group told me that they had worked day and night, literally, for this play. They were all praises for the director, young Rudradeep Chakraborty. And as the preparations advanced, I could see the passion of the man which was matched equally by the lead actor Tom Alter (see pic below). When the play finally started with the mesmerising beats of the Qawwals, I was lost in another world. The play was not a conventional stage performance - here there was no demarcation between the audience and the actors. Everything blended together to give you the feeling of a 3-D theatre were you feel every movement. In the same way, you could feel every emotion as Alter as Dalrymple took you through his travails in Delhi. And I must say, he gave a splendid performance as did all the other actors - Zohra Saigal as Norah, Ahmed Ali the writer, the eunuchs, the kabooter baaz and all the others. And yes, did the play do justice to the book? I would say yes because it captured all the excitement/exasperation/sympathy that Dalrymple has portrayed in his account. I won't give much of the plot away as it is only to be experienced first hand. So I would suggest all self-respecting Delhiites to book their tickets immediately - City of Djinns is too good to miss. It's on till 26th April. after such heavy recommend, will surely try to catch it, if I could. Meanwhile, if you liked city of djinns (the book) you will love the last moghul. a far better researched work about delhi (specially the 1857 seige) and zafar. Yes, its on my bookshelf beside the other books-in-waiting! Enjoyed White Mughals so I am sure I'll like this too. man tarana..... u've touched a sour spot with this terribly intriguing entry on city of djinns! one of my fav books too but just cudnt watch the play cos of an exam :( hope ure going to write up on the play since i suppose u watched it yesterday? please do - can enjoy it vicariously at least! !